These snow-white swans with coal-black bills dabble (that is, go bottom up) for aquatic plants. 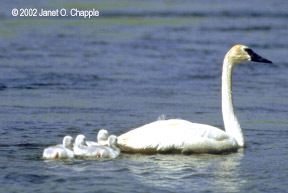 Some trumpeter swans nest along the Madison River. 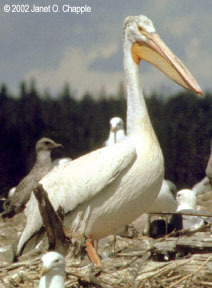 Three hundred eleven species of birds had been identified in Yellowstone by the year 2000. 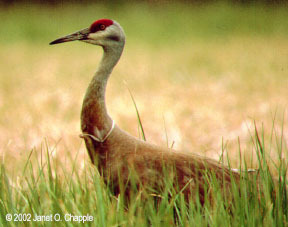 A bird lover could spend his or her whole visit to the park just watching birds. Here are ten good bird-watching places with some of the types of birds you may find there. On Beaver Ponds Trail and the Upper Terrace Drive at Mammoth Hot Springs, look for: red-tailed hawks, golden eagles, woodpeckers, mountain bluebirds. Floating Island Lake near Tower-Roosevelt Junction: yellow-headed blackbirds and American coots. Ponds east of Junction Butte: red-winged blackbirds, yellow-headed blackbirds, mallards. Slough Creek campground road: ring-necked ducks, lesser scaup. Soda Butte on the Northeast Entrance Road: cliff swallows nesting on the back side of Soda Butte. Seven-Mile Bridge area on the West Entrance Road: trumpeter swans (now rare in the park), mallards, Canada geese. Pelican Creek bridge east of Fishing Bridge Junction: American white pelicans, California gulls, Barrow’s goldeneyes, mallards. Fishing Bridge meadows, about two miles north of Fishing Bridge Junction: pelicans, gulls, geese, Barrow’s goldeneyes. Mary Mountain Trailhead turnout, overlooking Alum Creek and the Yellowstone River: sandhill cranes, mallards, Barrow’s goldeneyes. North Rim Drive at Canyon, especially Lookout Point: ospreys’ nests on the pillars of rock in the canyon. CREDITS: All photos on this page are used courtesy of the U.S. Department of the Interior, National Park Service, Yellowstone National Park. IN THE GUIDEBOOK: You can find more information about these birds in the chapter of Yellowstone Treasures called “Living Things: A Yellowstone Sampler,” pages 337–40 and 348–49 of the fifth edition.